Published: Jan. 22, 2013 at 10:02 a.m. Updated: Jan. 22, 2013 at 02:05 p.m. 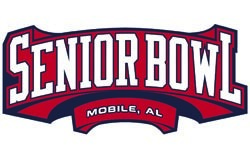 I don't pay attention to the draft process until the Senior Bowl. There's too much going on in the NFL, and three months of buildup to the NFL Draft is plenty for me. That makes this week's practices in Mobile, Ala., my first chance to go to school on a lot of these prospects. Before I worked at NFL.com, I used to watch all the Senior Bowl practices on NFL Network, take some notes and hope I learned a few things by osmosis from Mike Mayock. There's no reason I should stop the habit now. 1. Seven seniors skipped the event. Mayock has the biggest problem with three of them: West Virginia quarterback Geno Smith, Wisconsin running back Montee Ball and Texas safety Kenny Vaccaro. Mayock said Smith is mistaken if he thinks he's already locked in as the top senior quarterback and destined for the top 10. 3. I already wrote about Mayock's remarks how 3-4 quarterbacks could get taken in the first round. Most of them are probably at the Senior Bowl. Miami of Ohio's Zac Dysert hasn't received a lot of publicity, but Mayock sees him right in the mix with other known names like N.C. State's Mike Glennon. Dysert has good movement skills and can throw on the run well. Glennon has a huge arm, but has struggled with accuracy. This isn't a class that has a quarterback with a similar skill set to Robert Griffin III or Russell Wilson. 4. Mayock compared Syracuse quarterback Ryan Nassib to Andy Dalton and Kirk Cousins because of Nassib's intelligence and love of the game. Nassib doesn't have a huge arm, but "can make all the throws." Why does that not get me excited? It's too early in the week to talk about "risers" from the week. The pads come on Tuesday. Practices air on NFL Network from 2-4 p.m. ET. We'll do these takeaways again Wednesday morning.